To focus on shorter distances, s-mount lenses have to be “unscrewed” . On first glance this seems to be very different from larger Lenses like C- or CS-mount Lenses, that provide a focus ring. If the focusing ring is turned however also in larger lenses the position of a lens package from the sensor is increased. (There are a few exception of lenses that offer more than one lens package that are moved synchrously, one of this maybe towards the sensor) . May the lens be focussed on infinity. What happens when you increase the distance of the lens package from the sensor, for example by unscrewing or by turning the focus ring? For the object at infinity, no unscrewing is needed, so we have wF# = F#. The amount of light that reaches the sensor is determined by wF#, the working F#. wF# depends on the diameter of the Entry pupil, but the brightness depends on the area of the entry pupil. The resolution is half that diameter R = D/2. The resolution of a (non telecentric) 1:1 lens is about half the resolution of the lens in infinity position , both in x and y direction. If the lens could resolve 5 Megapixel at infinity before, the resolution drops to 1.3 Megapixel if it is used in an 1:1 setup. The Field of view gets smaller: Because the lens is not telecentric (but “entocentric”), the lens arrives at some Angle > 0 in the corners of the sensor. We can imagine this as an image side (half) viewing angle. That angle is called (max) Chief ray angle) When the lens is in infinity position. When we increase the distance to the sensor, tha maximum angle stays the same, but some of the light will no longer reach the sensor. This means, only a smaller fan angle on image side can be used. This implicated that also only a smaller angle on object side can be used! There working distance changes, because the ratio of object distance and image distance is the Magnification, which changed. The Chief Ray Angle CRA changes. This it the off axix angle at which the light arrives in the sensor corners. 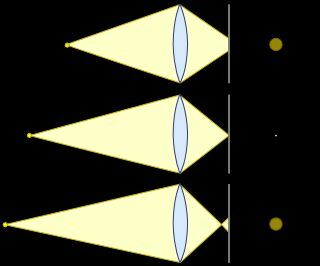 Lenses that were designed for infinity, assume that the light arrives about parallel at the lens. This clearly definas angles at with the light arrives at the sensor surface. By changing the working distance from infinity to a shorter distance, maybe even below the MOD, these angles change. But for these new angles the lens was never designed, so the performance MUST suffer. Telecentric lenses behave different: The image side F# is Magnification times the object side F#. For an 1:1 lens for example is the imageF# = object side F#, the resolution on image and object side is the same (and not factor 2 lower than with entocentric lenses. Also the image brightness does not decrease by factor 4. This entry was posted in Practice on January 5, 2018 by Michael Schäfer. Lets assume the object is at infinity because only there, the F# is defined and the image shall be focussed). So EPD = focal length / F#. All light arriving parallel to the optical axis in a cylinder with this diameter enters the lens and is focussed to “somewhere” on the optical axis. Per definition, the focal length is the distance of the image side principal plane to the image of an on-axis object point at infinity position. This image is called Focal point. As the image is focussed, the focal point is located where the optical axis intersects the sensor. In Practice, this is not necessary the center of the sensor! The sensor might be shifted! Determination of the angle under which light arrives in the focal point. The distance of the image side principal plane H’ and the sensor is the focal length. We also have the EPD. So arcsin NA is half the angle and 2 arcsin NA is the full angle. Fomr the Chief Ray angle and the image circle we can find the intersection point where the rays arriving at the image circle rim under the angle CRA. We call this point exit pupil center EPC. The F# determined the image side NA. we get the exit pupil as intersection of the resulting cone in the distance of the XPC. P, together with the optical axis defines a plane. The intersection of this plane with the exit pupil defines a segment where it intersects with the exit pupil. The min / max of the off axis angle (absolute value) of the left and the right segment end points to Pdefine the min and max Angle at which light arrives at P.
With the XPD we get an on-axis cylinder of the diameter XPD. 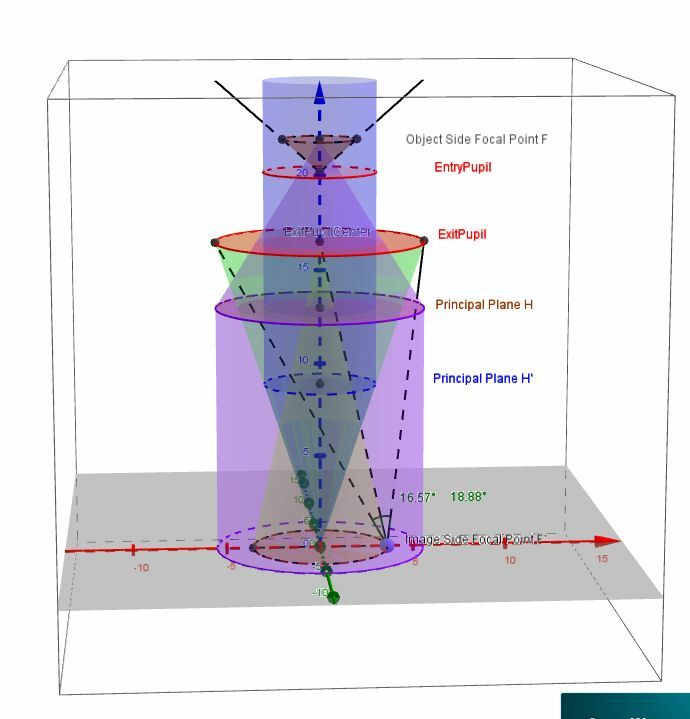 Light arriving from Infinity parallel to the optical axuis inside this cylinder is focussed in the object side focal point F.
the principal plane H is by definition perpendicular to the optical axis through a point that is “focal length” away from the object side focal point. If light from various directions arrives from the image side direction exit pupil, then at a plane perpendiculat trough the Object side focal point theres a disk of light we for now call “object circle”. Where the rays through the rim of the object circle arriving at the Object side chief ray angle meet is the Entry Pupil Center. “EPC”. From entry pupil position and diameter we have the Entry Pupil. All object side ray that are in the field of v iew and go through the entry pupil have an image in the image circle. This entry was posted in Uncategorized on May 18, 2017 by Michael Schäfer. What is it in general? Resolution describes in general the ability of a “system” to provide “details”. Systems can be anything, a thermometer , a speedometer in a car, a TV screen, a printer, … and last but not least cameras and lenses. How much resolution makes sense? When people talk about cameras, easily a Megapixel race starts. The general optinion in the consumer market may be “the more, the better”. Marketing is the big player behind the scenes. If my competitor offers 1 Mega-something and I can offer two Mega-something, this is usually reason enough for the subconcious mind of the consumer to go for the higher number. All depends on the information we need. If we are interested in the position of the Alpes with an accuracy of +/-100km , the right image above definitely has enough resolution. No need for a map with a resolution that shows individual cars. Do we need to know the temperature with a resolution of 1/100 degree? For half a century a VGA TV resolution (640×480 pixels) was just fine for us to get the “needed” information. These days HDTV and 4K resolution is a must. Again .. it’s nice to have, but is it needed? A strange phenomenon in terms of resolution are .. Desktop printers: They once offered like 200dpi .. some offer 9.600dpi these days. dpi is short for “dots per inch”. It does not mean however that a printer could print 1/200th of an inch thin lines then nor 1/9600th of an inch wide lines now! When a new TV with extra high resolution appears at the market, the prices are very high. This is because the manufactures obviously can sell it at that price and because the development costed lots of money. Once this new resolution becomes standard, the prices drop considerably. Highres Cameras need much better lenses. As the bandwidth (=pixels per second) of an interface is limited, if the number of pixels grows by a factor, the frames per second go down by this factor. When we can get color images the same resolution as greyscale images before, the software got to be adapted. If we there are more pixels per image, we have to process more pixels, if there are more frames per second, we have to process more frames per second. A faster software, a faster computer, even a better programmer might be needed. With shrinking pixel sizes, the “noise” increases. Algorithms might have to be adapted to the previously absent noise, additional light sources might be necessary to provide enough light for a low noise image. With shrinking pixel sizes, the light sensitivity is reduced, which might cause problems in dusk and dawn. As color images in general work with a ratio Red : Green: Blue, special care has to be taken about sensor noise, as this influences the ratios, say, the colors. The higher the resolution, the more difficult it is to have a high “local contrast”. The optical term contrast of an image is pretty much what we would expect from our daily use of the word. The global contrast in the two images above is about the same, however the local contrast (the change from pixel to pixel) is less high in the lower image, because of the slight blurring. Apart from the production quality, the resolution of a lens is limted by a physical effect called “diffraction”. The “best possible” lenses are called “diffraction limited”, read : they are as good as allowed by physics … “only limited by diffraction”. In short, diffraction is an (unexpected) change in direction of light particles that occurs if they don’t have neighbors “travelling” in the same direction. As a result diffraction occurs at the rim of a lens iris, at the surface of metal rods, threads etc. The degree of diffraction depends on the amount of “rim” compared to the “clear” area. The area of a circle is A = PI * radius * radius. The length of the circumference of a circle is R = 2 * PI * radius. Say, the smaller the radius, the more influence has the rim, compared to the center.Also, the higher the energy of the light, the less diffraction occurs. Say, blue light has a lower diffraction than red light and red has a lower diffraction than infrared light. The resolution of such a lens is R = 1.22 * wavelength * F# at about 20% contrast. As 1000nm = 1um, we get as a rule of thumb D = F# um , say, the F# in micrometers. As 1000nm = 1um, we get as a rule of thumb D = 2*F# um , say, two times the F# in micrometers. One way to achieve a better resolution it to use a smaller wavelength for the lens design (i.e. 440nm blue instead of 660nm red or 660nm red instead of 890nm infrared. For diffraction limited lenses with an F# below the optimal aperture : The higher the F#, the higher is the DOF, the lower the resolution and thus the lower is the local contrast (= lower MTF) . If lenses are not diffraction limited, increasing the F# makes means using more the center parts of the lens elements (which have lower aberrations). Therefore the resolution increases for a while until the critical aperture is reached, then it decreases. This entry was posted in Practice on August 23, 2016 by Michael Schäfer. Some centuries ago, people noticed with some surprise, that in a dark room sometimes an (upside down) image of the environment is projected across a small opening in a wall. The old latin word for room (chamber) is camera. 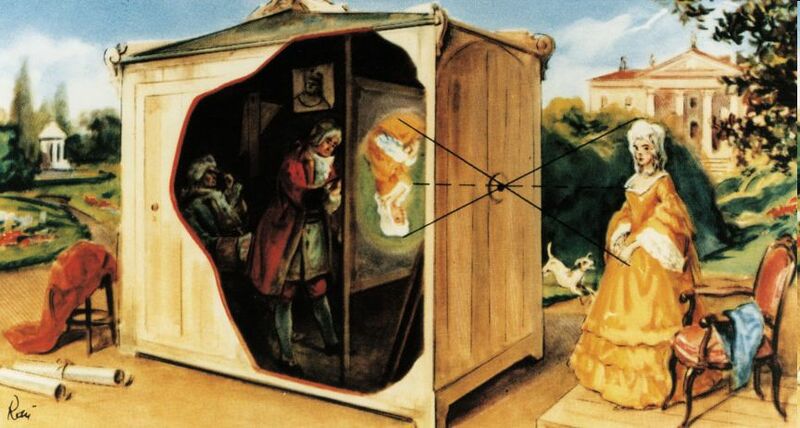 That’s why the first cameras got the name “camera obscura” ( = “dark chamber”). One of the first real-life-applications was portrait painting. Its immediately clear, why the image is upside down. The advantage is however, that the Image is were it would be mathematically expected. There is no distortion ! (rectangles on object side becomae rectangles on image side). There’s no visible dependency from the wavelength. The depth of Field is infinitely large. The disadvantage is that the resulting image is very dark, (so the room must be even darker for the image to be seen at all. The needed exposure times to take an image with todays cameras could well be minutes! Now, however, the image not only gets brighter (as intended) but also gets blurry, because the light not only passes through the center of the hole. So not only the correct position of the image is exposed to the light, but also the direct neighbours. As a result, the image of an object point is not just a point, but instead a little disk, the so called “Circle of Confusion” (CoC). For long distance objects the diameter of the CoC equal the diameter of the hole! For short distance objects, even larger. Read, the “resolution” is very bad. Whish: Each image point shall be just a mathematical point and not a circle. Note: every point of the front lens is reached by light from the object. How to predict what size the image will have and where the position of the Images of object points is? Rays through the center of the lens pass straight through the lens. Rays arriving parallel to the optical axis and through the object point are “bent” through the focal point of the lens. Where these two rays meet, is the image of the object point. All object points on the plane perpendicular to the optical axis (the “object plane”) are mapped to another plane perpendicular to the optical axis, the “image plane”. If image and object distnces are given, we can calculate the focal length of the lens. This appoach is used in all them focal length calculators online. The lenses are perfect, say don’t have optical aberrations. In case of the thin lenses : all lenses are infinitely thin. The model assumes sin(x) = x, which is an approximation that holds only very close to the optical axis. Objects at different distances result in CoCs of different size. Bad news: The Circle of Confusion (“CoC”) can not become arbitrarily small. It willl always stay a disk and never becomes a mathematical point. The theoretical size of the smallest CoC possible even for close to perfect lenses , so called diffraction limited lenses) is described by the so called Rayleigh criterion. For white light it’s not possible to generate CoCs smaller than the F# measured in micrometers. A diffraction limited lens of F#4 can not generaqte image points smaller than 4um in diamter. An image appears focussed, if the CoC is smaller than the pixel structure of the sensor. See also Why can color cameras use lower resolution lenses than monochrome cameras?. Keep in mind that the Megpixel refer to the maximum image circle that a lens has. If a sensor uses just 50% of the area of image circle, only half the pixels are supported. If a 5 Megapixel 1″ lens (i.e. image circle 16mm) is used on a 1/2″ sensor (image circle 8mm) one should not expect a resolution bettern than 1.3 (!) Megapixels. This is because the area of a 1/2″ sensor is 1/4 (!) of the area of an 1″ sensor!. So you lose factor 4 of the Megapixels. This entry was posted in Practice on August 22, 2016 by Michael Schäfer. DOF := Far Point – Near Point. The formulas for these are really complicated and contain several times the focal length. The focal length has no influence on the DOF if FOV and are constant. As long as FOV and F# are both constant, the DOF is the same from whatever distance. Because the brighness shall stay the same, the F# is the same. Because the FOV is the same, also the Magnification is the same for both lenses. Because the F# is the same, also the NA (Numerical Aperture) is the same. As , also the angle doesn’t change. Our definition of sharpness, the allowed circle of confusion, of course shall not change. Also, due to the Rayleigh Criterion, the resolution of the lenses is the same (assuming lenses of the same, diffraction limited excellent quality). So if we have a close look at the location where the light gathers for one pixel, we see .. The red disk shows the smallest Airy disk Possible, according to Rayleigh – controlled only by Wavelength and . (See Rayleigh Criterion). The diameter is (according to Rayleigh) twice the lens’ resolution. The green disk is the user’s definition of “is still focussed”. As the angle is constant, so is , which is the opening angle of the double cone at pixel level. As angle and slimmest part of the double cone are the same, so is the upper and lower point where the Green disk touches. The distance of upper and lower max. point of the green disk is the image side Depth of Focus. The object side DOF (depth of field) is Depth of Focus / Magnification , which is constant, because the FOV is constant. This entry was posted in Practice and tagged depth of field, DOF, far point, near point on October 1, 2014 by Michael Schäfer. Light travels straight (in optical homogeneous media) and changes directions only at the interface between air and glass or at the interface between two types of glass. To change lights directions additional lens elements will be needed (for the assumed optimized lens). More glass means higher cost and a larger footprint of the lens (let alone a redesign of all other lenses in the system … you in general can’t just change ONE lens element but have to work holistic. A new lens element or a reshaped lens element influences all other lenses in the system. As production costs are limited by constraints of the target price and the mechanics, there definitely are limits for the s-mount lenses and markets that will be c-mount markets for a long time or forever. A general replacement is c-mount by s-mount is not possible for the same reasoning, however in my personal opinion 50% or more of the c-mount lenses can be replaced by s-mount lenses. This entry was posted in c-mount, Lens Types, s-mount and tagged c, c-mount, comparison, s-mount on July 10, 2013 by Michael Schäfer. This entry was posted in c-mount, Lens Types, s-mount and tagged c-mount, comparison, features, s-mount on July 4, 2013 by Michael Schäfer.